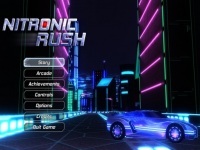 Nitronic Rush is a unique futuristic 3D car racing game developed by students at Digipen Institute of Technology. Actually this is not a typical car racing game, instead it is an experimental one. The racing car in Nitronic Rush has special overplus such as ability to jump and even fly using it's built-in wings. The race tracks are set in the dark night at a city with colorful lights everywhere. The challenging from this game is the tracks are so unique and rather similar to roller coaster floating and wavy on air. Several parts of the road are shifted up makes the car should jump. And also some sections of the roads are cut off far enough to force the car to use wings to fly up and go back down on the next part of the street. However, flying the car is not easy to control especially to land it on the street. Indeed you will need more time to get used driving the car including when flying on the air. Now it's your turn to play and feel different experience with this game.